THE MIDDLEWICH DIARY: WHO ATE ALL THE HOWE'S PIES? 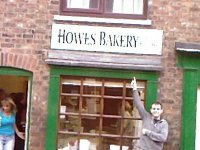 In the wake of the devastating news of the closure of Howes bakery, Jamie Campell started a Facebook support group for those suffering the trauma of HPD (Howes Pie Deprivation) and the link is above. Geraldine Williams: Middlewich seemed to go into mourning when Howe's closed! Geraldine Williams Oooh! You're a brave man - talk about 'light blue touchpaper and retire'..........!! Dave Roberts My partner Lynne comes from Huddersfield, in real pie territory, and, when she first came to Middlewich was offered 'a real treat' in the form of a Howe's pie. She pronounced it 'nowt special' and was amazed when I agreed with her. The other great Middlewich fast food claim to fame, about the superiority of Etta Mault's fish and chips was, and is, fully justified. As you can gather, we're very keen on health food. If you have any other photographs of this famed Middlewich establishment, or any information on the famous Howe's Pies, please let us have them. Don't let my disgraceful prejudice put you off - taste in pies, as in everything else, is very personal! and also the above photograph of the bulletin posted on the door of Howe's when it closed, rather like those sombre announcements on the gates of Buckingham Palace when a Senior Royal has expired, or is about to do so. UPDATE (JANUARY 2019) Sadly, the CHESHIRE PIES site has, since this diary entry was last updated, also become defunct, in this case because TalkTalk has closed all such sites. Is there, perhaps, a plot to prevent the glorious history of the glorious Howe's Pies becoming better known? We think we should be told - Ed. Geraldine Williams Howes' had two adjoining shops in Lewin Street: the baker's, run by Mrs Howe (the bakery was behind the shop and the baker was her son, Cephas - wonderful name!) and the other was a sort of second-hand shop run by the other brother, Rowley, who did house clearances, etc. There was also a daughter who helped out but we can't remember her name. Dave Roberts I used to spend a lot of time in the second hand shop talking to Roland. At that time,, in the early 60s, people were getting rid of such things as wind-up gramophones and the accompanying 78 rpm records and I bought an old HMV 'table' model from him once and transported it back to King Street, via Lewin Street, Leadsmithy Street and Kinderton Street on my trusty 'go-cart' (built, in the fashion of the time, from old pram wheels, a wooden box and other bits and pieces. After that I would buy boxes full of 78s at half-a-crown a time and take them back to our garage where the gramophone had taken up residence (it wasn't, of course, allowed in the house). I'd spend hours playing such classics as 'Rose, Rose, I Love You', 'The Ballad Of Robin Hood' and 'The Man From Laramie' Roland heated the shop in winter with a paraffin heater, and the fumes from this, combined with the warm smells from the bakery next door produced a delicious drowsiness as I sat and listened to him talking about all the fascinating stuff in the shop. The worrying thing is that I can remember most of the words to all the tunes you mention! First published 5th July 2011. Apologies for the formatting errors in this Diary Entry. They'll be sorted out soon.